In this article, we will be looking at some of the common caching techniques in PHP: Opcache, Expires Headers and Query Caching in MySQL. We’ll look at additional approaches in part 2. Before we move on, it’s important to understand PHP’s request lifecycle. 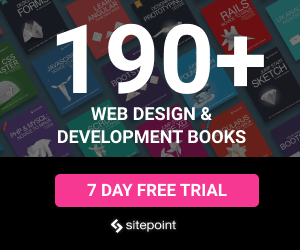 What happens behind the scenes when you access a PHP file from the browser? A file is fetched from the file system – it doesn’t really matter if it has changed since the last request. Lexical analysis – the human-readable code is converted into something (tokens) that the parser can understand. Parsing – the machine-readable strings are analyzed for potential errors. This is like grammar-checking. Opcode Creation – the tokens that we got from step 2 are converted into machine executable code. Machine code execution – machine code is processed and then executed. For a more in-depth explanation, check out this article on how PHP echos a Hello World. All of those steps happen really quickly, and yet there is a lot of time and resources wasted on every request. That is because for every request for each PHP file on the server, the server has to go through all of them. The caching techniques that we will be going through in these two articles help bypass steps 2, 3 and 4. That means less time and fewer resources wasted, leading to faster page load times for the user. 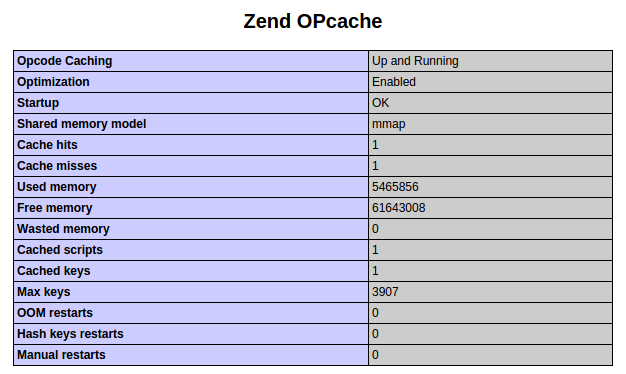 The first caching tool we’re going to look at is Zend Opcache. Don’t forget to restart PHP to activate the changes. opcache.memory_consumption – the size of the shared memory storage used. This is expressed in megabytes and defaults to 64. You can go higher, depending on how much power your server packs and how much memory you think your application is going to need. opcache.interned_strings_buffer – The amount of memory used to store interned strings, also in megabytes. An interned string is an approach in which only a single copy of each unique string is stored in memory. opcache.max_accelerated_files – The maximum number of files that can be accelerated by opcache. Only numbers between 200 and 100000 are allowed. opcache.revalidate_freq – The number of seconds after which to check PHP files for changes. Giving it a value of 1 means checking for changes once per second, but only once per request. 0 means it will always check for changes. This is the optimal setting for development environments. opcache.max_file_size – Allows exclusion of large files from being cached. By default, it has a value of 0 which means that all files are cached. The value for this option is expressed in bytes. opcache.fast_shutdown – When enabled, the deconstructors get a speed boost at the end of each request. This means that the subsequent request becomes faster. By default, it’s set to 0. Setting it to 1 will enable it. More configuration options are available here: OPCache Runtime Configuration. It will show you the memory usage, hit rate, and the configuration options that you have set. You can also reset the cache or invalidate files manually. We can also use Apache for caching (instructions for Nginx at the end of this section). With Apache, we can mainly cache static files such as stylesheets, script files, images and other media files. By default, Apache uses etags. These are hashes of a file that are sent in the response header. The browser doesn’t make a request for that file again if the etag is the same, and uses the cached version instead until the default value for the expires header becomes greater than or equal to the time on the client’s computer. But when you make a change to a file, the etag changes and the browser will have to request the file again from Apache. This is all well and good, but we can take it further by specifying an expiration time. That way we can have the browser hold on to the cached version of the file for a longer period. Specifying an expires header via Apache tells browsers to cache static resources for a specific period of time. The first line enables the expires module and the second line restarts Apache in order for changes to take effect. Once that’s done you can use the expires headers from your virtual server’s configuration file, usually residing in etc/apache/sites-available or something similar – check your installation’s documentation. ExpiresDefault – allows you to specify the default expire rule for all static files. This accepts the maximum timeframe during which you want the browser to hold on to the file. ExpiresByType – allows you to specify the expire time based on file type. This accepts the mime type as the first argument and the expire time as the second. To configure expiration headers for Nginx, see this excellent post. For web applications which mostly read data from the database, you can take advantage of query caching. This puts the parsed version of an SQL query and its corresponding result set into the cache which in turn makes subsequent requests for pages using the same set of queries retrieve the results faster. This is because your application no longer has to go to the database to parse the query and fetch the results. 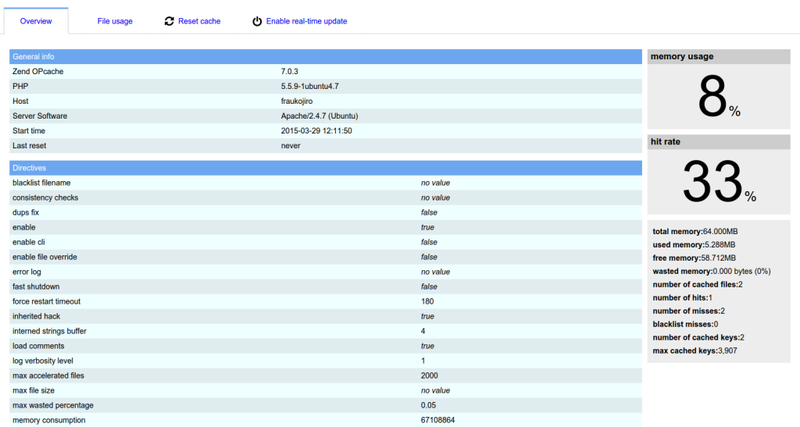 In this case the version is 5.5.41 so I know that query caching is enabled. If you have version 5.6.8 and above you need to enable it. You can do so by editing the configuration file. On Ubuntu, it’s in /etc/mysql/my.cnf. query_cache_type – allows you to specify whether to enable query caching or not. You can set the value to either ON or OFF. 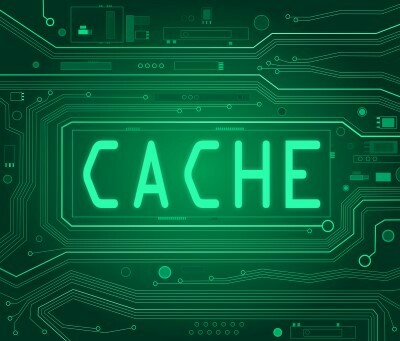 query_cache_limit – the maximum size of a result set that can be cached per query. Note that when a specific query has a result set exceeding the value specified in this option, it wouldn’t be included in the query cache at all. query_cache_min_res_unit – the minimum amount of memory that can be allocated to store a query. query_cache_size – the total size of the query cache. query_cache_wlock_invalidate – allows you to specify whether to invalidate the query cache when a specific table is locked for writing. You can set the value to either ON or OFF. Note that the results returned for all integer values are expressed in bytes. 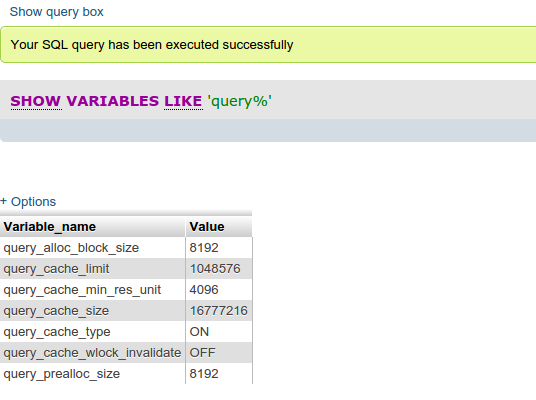 Execute a SELECT query in one of the databases that you currently have in the machine you’re working on. Take note of the values that you get and then execute the same SELECT query that you executed earlier. If you’re using phpmyadmin, you can just click on the refresh link under the query box. You can also do the same for the SHOW STATUS query. It should now have incremented the values for the Qcache_free_memory, Qcache_hits, Qcache_inserts, Qcache_not_cached, Qcache_queries_in_cache, and Qcache_total_blocks. 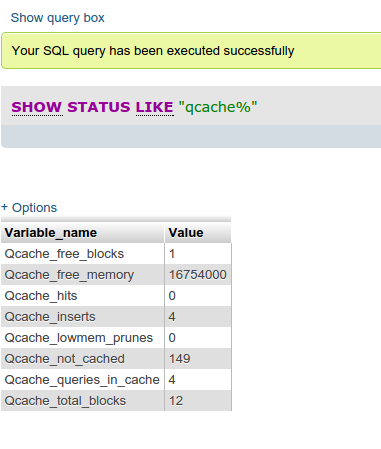 If those values have incremented then query caching is working. It only works with SELECT queries. SHOW queries aren’t cached since they are usually used for getting configuration values or general information about the server itself. Queries should be exactly the same in order for the cache to work. This means that if you update even a single character of the same query, it would be considered a different query, which means it won’t hit the cache. Only deterministic queries can take advantage of the cache. This means that functions like RAND() or CONNECTION_ID() or any other function which changes the results on each subsequent execution of the same query cannot take advantage of the query cache. Table updates such as when inserting new rows, updating the table schema, or updating a row automatically invalidate the query cache. In this part, we looked at some common caching techniques to use with PHP and MySQL. In the followup, we’ll take a look at some other software which can further speed up our apps – Varnish, Memcached and some PHP caching libraries. Stay tuned!